When astronauts come home in Orion from deep-space missions, they’ll need a strategy for a safe and efficient exit. At NASA’s Neutral Buoyancy Laboratory at the agency’s Johnson Space Center in Houston, teams performed a series of tests Oct. 6-8 to evaluate the most efficient way for astronauts to get out of the spacecraft after weeks or months away from Earth. During the three-day testing, personnel simulated approaching the spacecraft floating in the Pacific Ocean and what it would take to assist the crew as they exit. They also evaluated the layout of equipment inside the spacecraft that will affect exit and the gear used during the recovery process. Team members from NASA’s Orion and the Ground Systems Development and Operations (GSDO) Program demonstrated and evaluated the procedures, and a team from several branches in the Department of Defense specially trained in rescue techniques provided insight into ways to efficiently get the crew out, including in a case where the crew was incapacitated. 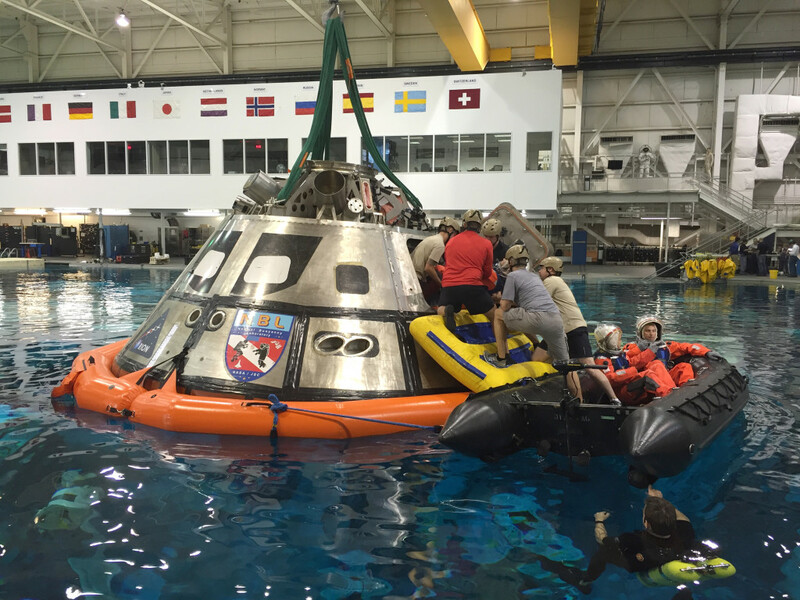 “This training is essential to help the Ground Systems Development and Operations recovery team be as prepared as possible to recover the Orion spacecraft after its first flight atop NASA’s Space Launch System rocket,” said Melissa Jones, GSDO Recovery director at NASA’s Kennedy Space Center in Florida. The buoyancy lab, a 6.2-million-gallon pool that is primarily used to train astronauts underwater for spacewalks, provides a controlled environment where recovery personnel can practice techniques to assist people getting out of a test version of the crew module. The facility had previously been used to develop ways to approach and harness Orion for its first flight test, Exploration Flight Test-1, last year. To read the full story, visit https://www.nasa.gov/feature/nasa-tests-crew-exit-strategy-for-orion.